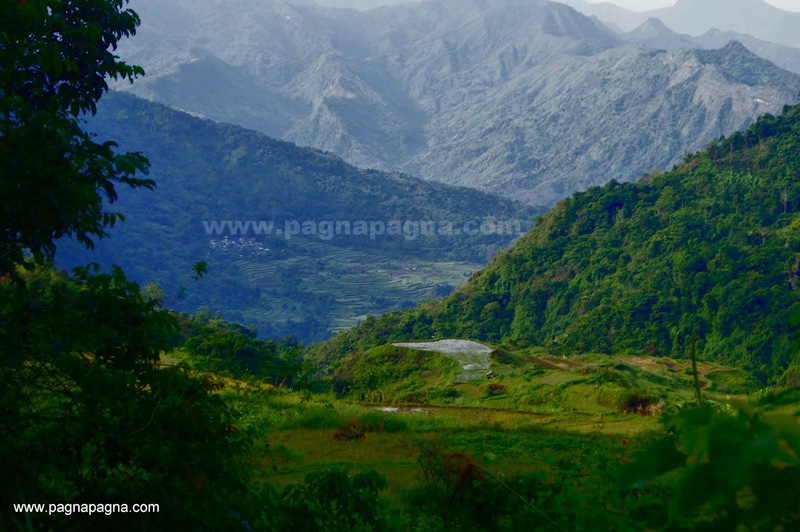 "A place named from a tree locally known as Daay"
Daddaay is a barangay in the municipality of Alilem in the province of Ilocos Sur. I was inspired by what i saw from the mountainside of sitio Marmarsang at barangay Batbato when i went there last week. I said to myself, I need to be there the earliest possible, to be intimate with its rice terraces and waterfalls. So, i went back and made it come true. As early as 5:37 in the morning when i arrived at Sudipen (La Union) and rode a passenger motorbike from there to get me to Alilem. At Alilem (6:18 am), I rode another passenger motorbike to take me up to the mountains, passed by barangay Batbato and arrived at a junction called "Abatan" (6:59 am). It is where the road from barangay Batbato, road coming from Municipality of Suyo and roads going to barangays Naonao, Sumade and Dagdag as well as to Daddaay barangay proper meet. Walked my way down the road that leads to barangay Daddaay proper (2.5 kilometers) and passed by some two to three springs that crosses the road. I finally arrived at the residential area - the barangay Daddaay proper and walked my way near an Elementary School where I saw some four people cutting grasses near the vicinity. I smiled at them and went near. I said "Good morning, sadino ti pagnaan mapan sadiay waterfalls?" (Good morning, where is the way to the waterfalls?). One of them replied smiling "Ay adda ti dalan dita ken idiay" (There is a trail on that way and also there). He added that i should be accompanied by somebody and said "Siak kuma a ngem nairana met ti panag brigada mi, aguray ta ibirukan ka ti mang kadwa kenyam" (I would like to accompany you but it's our turn to do community service - cutting grasses, wait, I'll go look for someone to accompany you). After a while, he did got somebody to accompany me. My guide that day was "Joven". He got a plastic bag of bananas and mangoes and a machete at his side as we walked through some terraces (8:39 am) that were dry and had not been readied for rice planting. Few minutes later we went down through a mountainside trail. 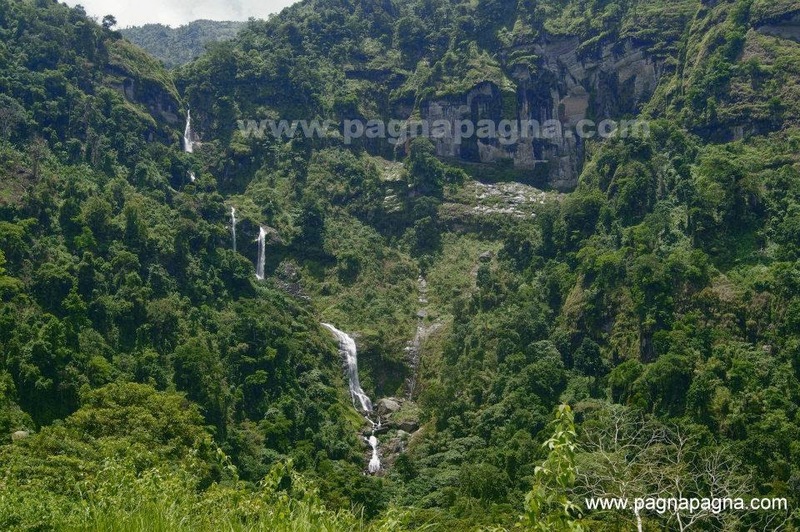 Then along the trail, at a distant mountainside rock wall, a weak streamline waterfall drops down freely called "Pacda" falls. 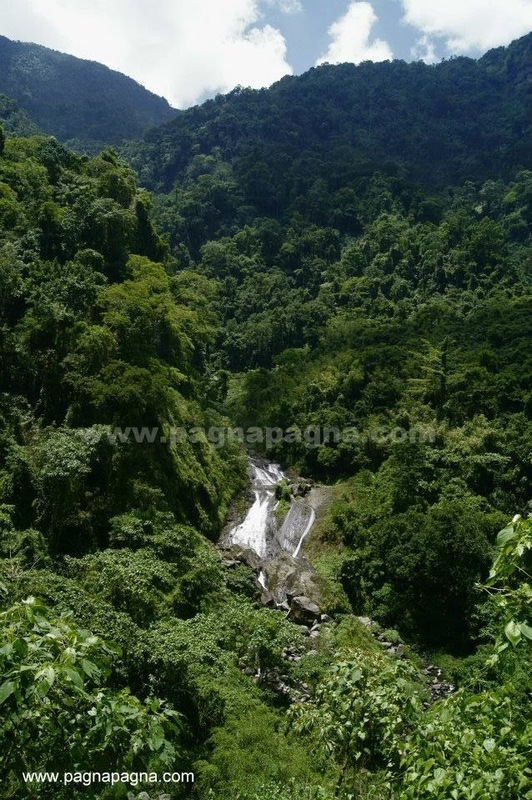 "Pacda" falls with little water falling during these summer months. 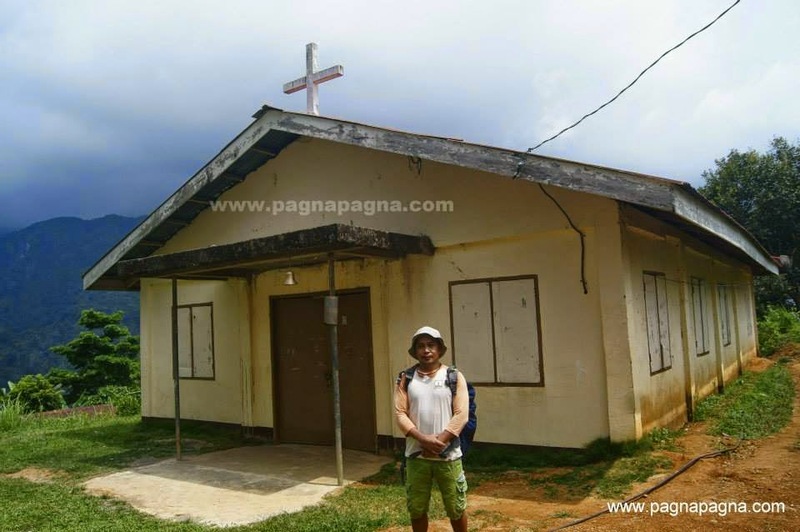 We continued our descend until we arrived (9:05 am) at a small, old and dilapidated shed that served as resting area for people going to the river, forest and rice fields. We seated on top of a rock near the shed and took a rest. After some few minutes, we walked down again and finally reached the "Pilingan" river. There he said, this is the "Kapilpilaan". It is some cascades that carves its way along the hard bedrocks and there were plenty of it as we went upstream. One of them is called "Ticol" and it was a small cascade. The river is also home to some wild animals such as the one we saw. From along the way, still along the river, on top of one of the higher cascades, we saw a snake of some 1.5 to 2.5 meters in length, slithering its way on top of the big boulder below. It must have sensed our presence that it quickly went to hiding before i took out the camera to take a photograph. We continued walking upstream. 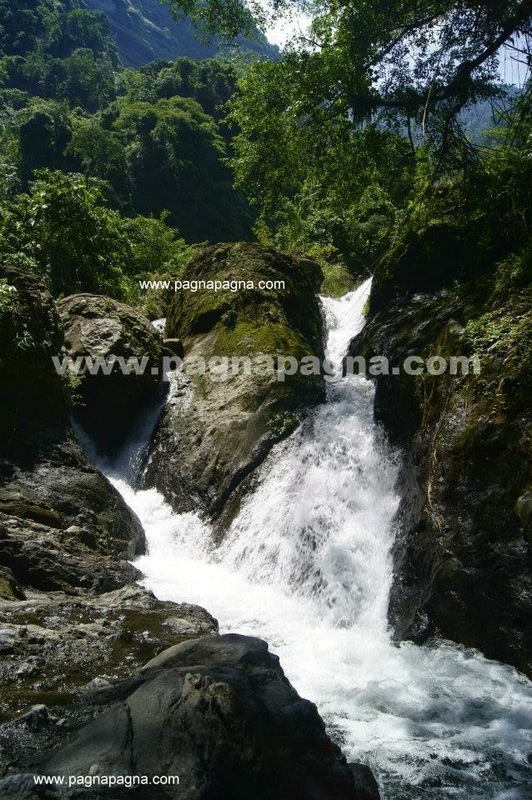 Passed by the intersection of two tributaries until we came near the lower cascade of the "Pongas" falls. It was a slanting face of rock were water flows. We should have gone farther up but the rocks looked slippery and besides my companion said that there was once a rope to cling on but now it is gone. We ate some of our prepared foods at the area while resting. Then we went to the other tributary just few meters away. At the other tributary we went to the base of the series of cascades of "Pan-ogan" falls where my companion took a dip. After he took a dip in its cold waters, it is now time to go back. We went to a trail different from the one we took earlier. It was all ascending/uphill trail. There where a short part were we walked on the side of a steep rock wall where it had a carved steps just enough for the feet. Thanks to some plants on the ravine side that it hides the scary open-air and good that there was a little inclination of the rock wall to lean on. He said "datoyen ti pagpagnaan ti kalding" (this is now the trail of the goat). We continued walking the uphill trail and we passed by another weak streamline waterfall that drops down freely from a distant rock wall. That is called 'Magay-udang" falls. Its name means "no crayfish". We arrived near the top and it was a clearing. 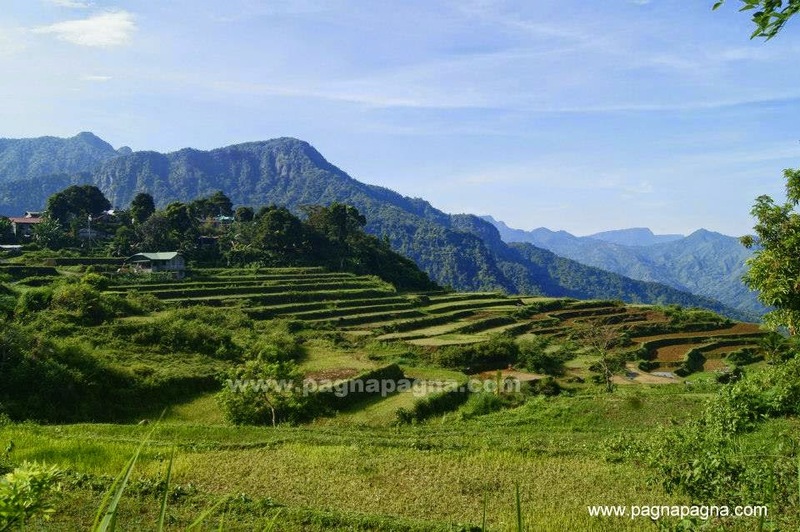 It was a rice terraces area where we can look back and see the two main tributaries to the "Pilingan" river which were the "Pongas" falls at the Southeast and the "Pan-ogan" falls at the Northeast. The small "Magay-udang" can also be seen located at the North-northeast. That's where we came from. 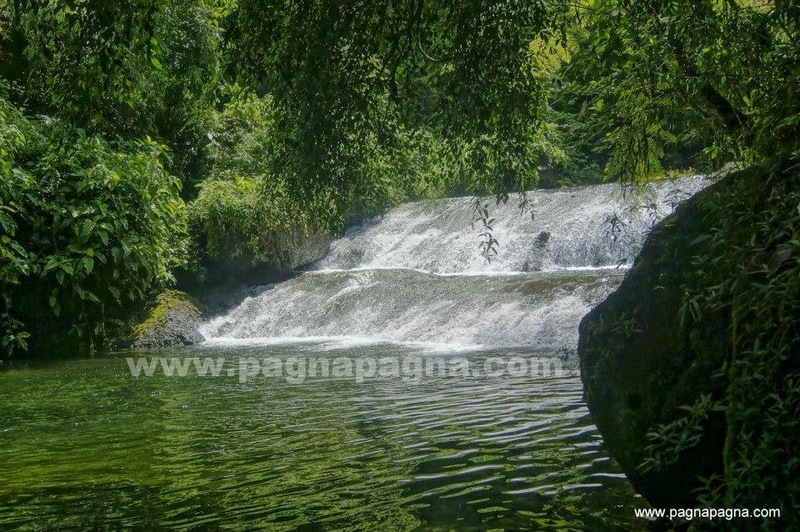 The lower cascade of "Pongas" falls. Zoomed-in view of the upper "Pan-ogan" falls from the trail. It was nearly noontime and the sun was at its hottest as we walked along the rice fields and terraces. To cool down, we took shelter on some trees along some springs. There were some three to four springs along the way that we passed by. Walking again further, we finally got back at civilization (around 1 o'clock in the afternoon). We were back at the barangay proper of Daddaay and had a snack at a sari-sari store. After which, we went to look around particularly the chapel and the rice terraces. 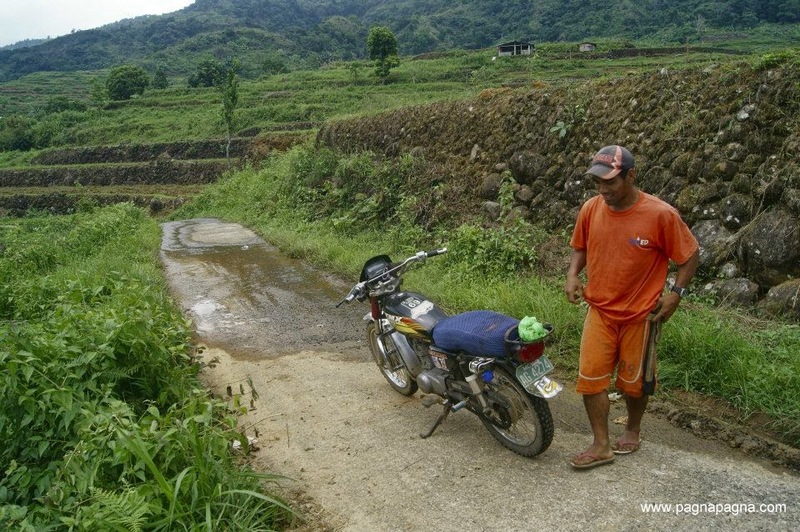 Here is "Alex" with his passenger motorbike getting ready to take me back to sitio Marmarsang. He is the one whom i first talked to when i arrived at Daddaay proper. After a brief look around of Barangay Daddaay, I rode a passenger motorbike (1:50 pm) going back to sitio Marmarsang of barangay Batbato and hoped to get a connecting passenger motorbike there but unfortunately i did not. At Sito Marmarsang (2:05 pm), I took a hike again passing by barangay Batbato proper. Some few minutes of walking along the downhill road to Alilem town proper, a jeep happened to passed by (2:45 pm). The driver called my attention and said "Aglugan kan" (ride on). I got free ride going to downtown Alilem. We arrived at Alilem town proper at 3:15 pm. I thanked the driver and went to the Municipal Hall and took some photos. Afterwards, i took another passenger motorbike going to downtown Sudipen, La Union where i took a bus going back to "Home sweet Home".